Matching his and hers towels are a fun, unique, and practical gift for weddings, anniversaries, or Valentine’s Day. But you don’t want to spend hours searching the internet for the best His and Her towel sets! No problem – I’ve done all that research for you. Here is my list of the Top 5 His and Her Matching Towel Sets. 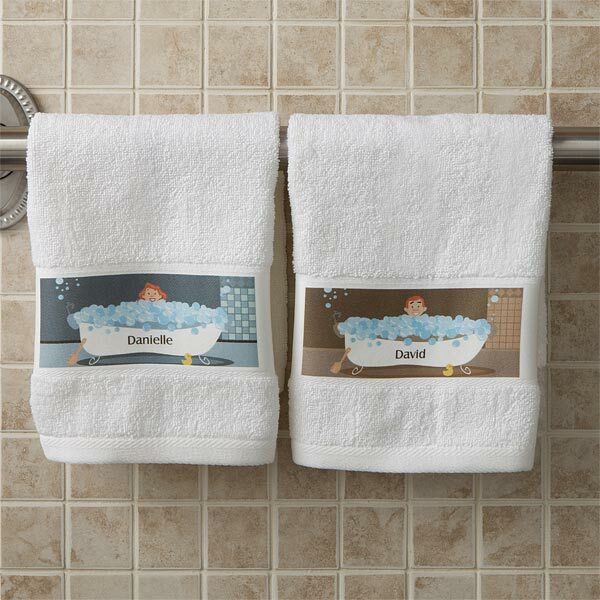 My top pick is this gorgeous personalized His and Hers towel set from Personalization Mall. These soft, fluffy towels will look great hanging side-by-side on a towel bar or even left lying on the bathroom floor (and at least everyone will know exactly who left their towel on the floor). 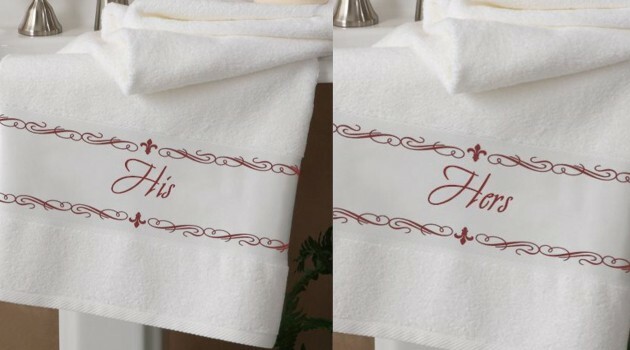 The plush 28″ x 50″ 100% cotton towels feature the title “His” and “Hers” written in elegant black script. Underneath is their first name in smaller red script. If you’ve left your shopping until the last minute, don’t worry – this towel set can ship out in just 1 or 2 days. Every home needs a nice set of hand towels for the master bath. Impress a favorite couple with these extra-plush hand towels made from high-end Turkish cotton. A wonderful housewarming, Valentine’s Day or anniversary gift! Are you looking for a his and hers gift for a couple that has a tropical vacation in the near future? 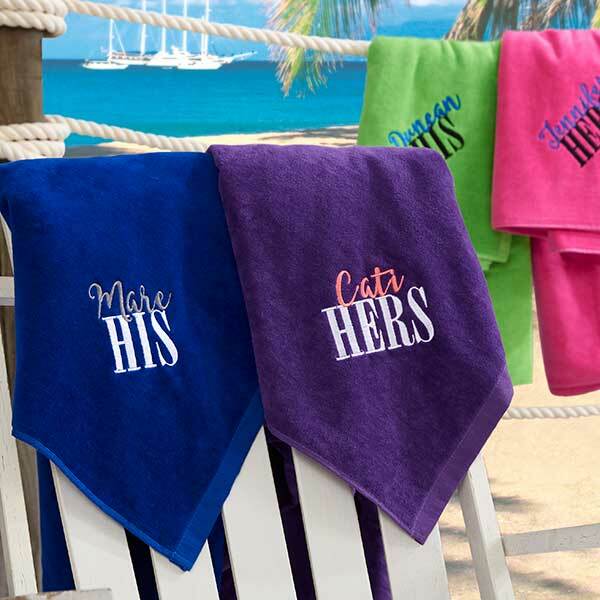 Then these colorful personalized beach towels are a wonderful choice! Who says towels have to be boring? They’ll chuckle every time they see these delightful personalized character towels. These 100% cotton terry white hand towels come in your choice of grey or beige background colors. You can choose from 4 different character color schemes for both the male and female character. You can add their own name to the bathtub, or use “His” and “Hers”. 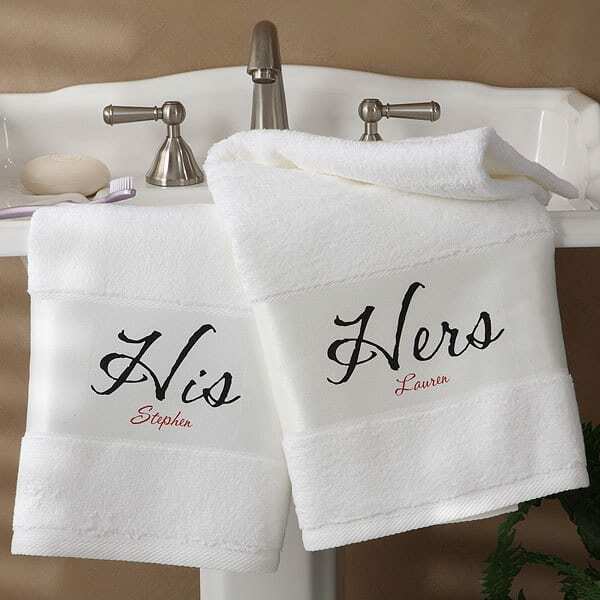 Pamper a special couple with a complete set of personalized towels. Choose from over 25 colors – mix and match to create a custom look to match their bathroom. Fabulous housewarming, wedding or shower gift that’s beautiful and useful. These elegant Fleur de Lis towels can be customized in elegant script with any name you’d like – I used “His” and “Hers” in the example above. The full-sized bath towels are a generous 28″ x 50″ 100″ cotton terry. The name and fleur de lis border are available in a choice of 8 colors (navy, black, Copenhagen blue, burgundy, silver, dark green, chocolate, or gold) – customize to match any bathroom decor. Each towel in sold individually – order two for a luxurious wedding or anniversary gift. They’ll never forget their wedding date when you give them this striking set of personalized towels that features their wedding date embroidered right on the towel! Two-piece set comes in your choice of 4 towel colors (you can mix and match his and her colors) and 40 embroidery colors. 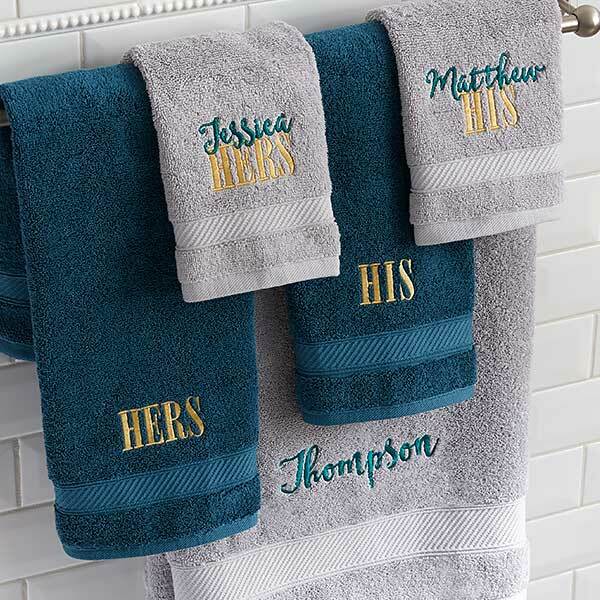 Pamper your favorite couple with these luxurious personalized towel wraps! 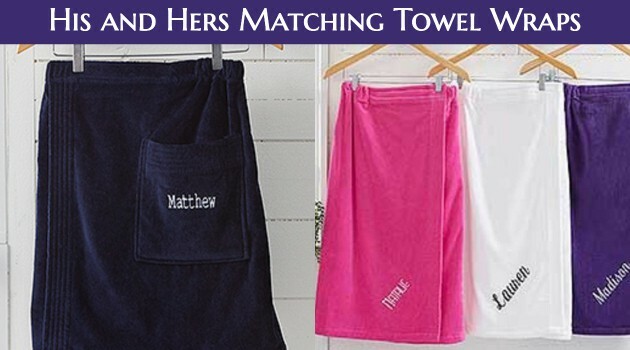 Soft and cozy towel wraps can be personalized with their name, monogram or the words “HIS” and “HERS”. Looking for a last minute gift? Choose express ship to have them sent in just 1 day! Show off the couple’s new initials (well, new initials for her – probably) with a set of monogrammed bath towels. An elegant monogram or initial adds a touch of luxury that they can use everyday!